Water, Water Everywhere: Mission Accomplished! Meet three of our youngest water campaign contributors this summer. 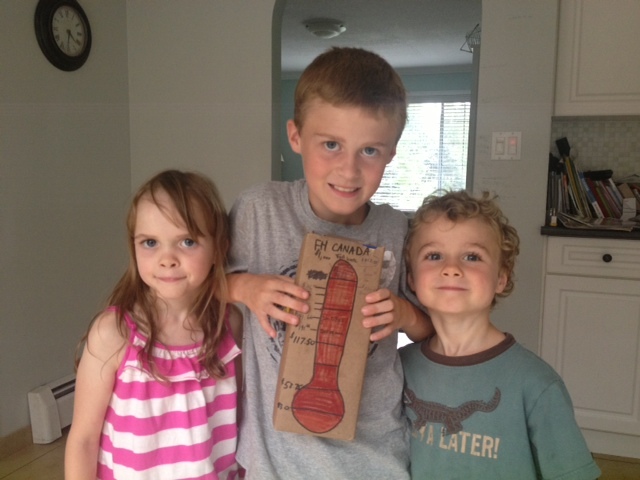 Nathan, Rachel & Caleb have been selling toys they no longer want and helping their dad collect and sell scrap metal. Last week they dropped by our office, gave us their hard-earned collection and showed off the "fund-o-meter" they made to track the money they'd raised. We're so thankful for them and for each one of you who has contributed to this year's water campaign. Because of your generous and often sacrificial giving, we've been able to reach our goal of $107,000. These funds will impact hundreds of families and address critical water needs. We look forward to keeping you updated on the progress of several water initiatives under way. Thanks for helping to end poverty - one community at a time! Food for the Hungry: Water, Water Everywhere: Mission Accomplished!